February, 1808 saw a major change in Bowie's life when he married Margaret Hill, ( b 1786-d 1826) the daughter of Alexander Hill, a well-known local maltster, Burgess and Guild Brother. Marrying, as he did, into a well connected and close knit family with solid roots in the community, something that he presumably lacked Bowie married well. The family connections of the Hill's were complex and, apart from Bowie, involved Gillies', Forresters and Napiers all wealthy landowners in their own right. That this family closeness persisted can be deduced from the fact that there is constant mention of the names in the family letters that have survived and a family photograph album of the Forresters, tentatively dated as early 1860s and forming part of the MacCutcheon Stirling Collection containing 'cartes de visite' for Forresters, Hills and Glass'. One of these families, was that of Robert Gillies, of Gormyre, near Torphichen. Robert Gillies was Margaret Hill's Uncle. An ex Provost of Stirling, (1823 and 1824 thereafter twice returned to the Council and acted as Treasurer), and a tanner whose tannery was located at the foot of the Craigs in Stirling. (See drawing based on Wood's 1820 map) This Craigs site is graced by the large Georgian town house Craigs House, built for Robert Gillies and it, and the Commercial Bank building, are undoubtedly Alexander Bowie's finest building projects in Stirling.
" It may not be generally known that Captain Forrester was lineally descended from Baron John Napier, the inventor of logarithms--through which line he inherited the property of Craigannet. Captain Forrester's Grandfather, also named John, the 4th Laird of Braes another house in the Carronbridge area, married Helen Napier heiress to the Napier estate and who inherited Wester Craigannet on the death of her brother John Napier. Given the social background of the Hills, Gillies' and Forresters marriage undoubtedly brought considerable benefit to Bowie's standing in the community when, later in 1808, he applied to become a Burgess of the Burgh - a position that would, at that time, give him considerable rights, privileges and status. The sponsorship of Bowie's application was made on the grounds of his relationship to Alexander Hill his father-in -law and not on his own family connections as was the usual practice. Nine months after the marriage of Alexander Bowie and Margaret Hill, on the 30th November 1808, their first born child, William, was born. After that, with an amazing degree of regularity, Margaret Bowie gave birth about every two years from 1808 to 1825. Of the ten Bowie children the two Alexanders and David died in infancy and little is known about Mathew who died in 1828 aged 14 and Alexander, a bank clerk, whose death in 1840, aged 20 was recorded in the local paper as ' the last surviving son of Alexander Bowie. William, Margaret, Helen and Robert and to a minor extent Christina are the only ones about whom there are surviving details and, as the remaining chapters of this book are about Helen, we will now look at the other children. In March 1825 Margaret Bowie, Alexander's wife, again became pregnant and gave birth to baby Margaret on the 16th November 1825. Some four months into this pregnancy David aged 3 years and 11 months died and this, together with the possible complications from Margaret's birth, may have resulted in health problems from which Margaret never recovered and on the 23rd July 1826, eight months after giving birth to Margaret, her tenth child, Margaret Bowie herself died at the age of forty. We have little information about daughter Margaret, apart from the fact that she spent all of her early life being cared for by family, friends and servants as by 1829 both her parents were dead. In the early 1840s she is to be found living with her sisters Christina and Helen in York Place Stirling. This house is listed in the Census of 1851 as belonging to Agnes Hill, sister of Margaret's mother ( see photograph) and, from this, we can assume that spinster Agnes brought the girls up. Mathew had died in 1840 at the age of 20 leaving only the three girls alive. One insight into Margaret's personality comes in a letter dated 14th December 1841 that she sent from Stirling to her sister who, at that time seems to have been staying in Linlithgow. This letter shows 16 year old Margaret to be someone of a very serious disposition with more than a passing interest in religion and older men. One is also struck with the stilted formality common in Victorian times and also, a theme that recurs frequently, with the closeness of the Bowie sisters with their cousins, the Forresters. The letter itself is also interesting as it consists of one sheet of folded paper sealed into letter form with sealing wax. As was common for the time writing was normal on three sides with the fourth side being kept for the address. Should the letter be longer than three sides the writer merely turned page one and wrote across the page again at right angles. ( See Photograph) For ease of reading I have split the letter into paragraphs. the original was not so written as, on one sheet of paper, space was at a premium. As I am in alone I think I cannot be better employed in writing to you. Aunt long out at Aunt Forrester's and Christina at dear Mrs Cupples. I have not been very well for a day or two but it is only something wrong with my stomach. We were all very sorry to hear that you have not been well at all, with none of us near you to take care of you my own dear. But you are under the protection of a higher hand who can give comfort when no earthly friend can. Who is mannah! to the hungry soul and to the weary rest. May he still continue to bless you and do you good. Uncle Hill says C is to say when she sees you whether she thinks you will be able to remain at Linlithgow or not before he sends Miss Young her money. I hope for your sake that you will be able to stay but I would rather like you to come home. It is fortuitous that the letter is dated 1841 because that was census year and although the returns were calculated on the 7th June that year and do not show Helen as being in residence, it suggests that, by Christmas 1841, she had only been there one term. From this information we know that Helen, aged 18, was a pupil at the boarding school run by Maria Young. The Miss Young of the above letter. DEATH OF ALEXANDER BOWIE'S WIFE MARGARET (HILL) 1826. Leaving the story of the Bowie children we return to 1826 and to what must have been one of the lowest points in Bowie's life. I called upon Mr Robt. Allan the Lecturer on Surgery whose lectures I attend; As he has not been able to lecture for several days past and never being out of his room. I explained my mother's case to him as near as I could and told him what Mr Johnstone had been giving as far as I knew. i called in the forenoon when I gave him a description of the case and he requested me to call back in the evening so that he might have time to resolve the case in his mind during the day. When i called back in the evening he told me that there were several things that I could not not give a particular account of such as whether my Mother perspires much or not, If she has a good appetite and if there is a great degree of fever about her. 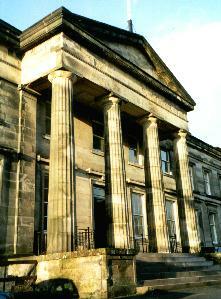 Sacred to the memory of Margaret Hill wife of Alexander Bowie builder in Stirling 23 July 1826. The Session met and being constituted by the Rev. Mr. Bennie, Moderator. They took into consideration the petition of Alexander Bowie, builder in Stirling formerly given in to them bearing that he is desirous to purchase that lair in the Church yard at Stirling No 169 said to be vacant ground. Bounded as follows; viz. On the North by No. 168 the lairs of John Burd Esq. West partly by No. 150, John Malcolm's lairs & No. 151 Miss Bauchope and Murdoch's, South by No. 170 Alexander Millars and on the East partly by No 186, Thomas Millars and No. 187 the late Provost Gilchrists--and craving that the session would confirm his right to the same. An edict having been served in common form for that effect called, returned and no objection made the session Decided and hereby do allocate appropriate and confirm to the said Alexander Bowie the foresaid burial place No 169 as above, described and bounded, containing eleven feet in length and seven feet in breadth and hereby declare the same to pertain and belong to him his heirs and successors in all time coming upon which an instrument was craved and taken in the Clerks hands and the said Alexander Bowie having paid forty four shillings Sterling to the Kirk Session for behof of the poor desired an extract which was granted. Margaret's death left Alexander Bowie with the care of William aged 18, Robert aged 14, Mathew aged 12, Christian aged 10, Alexander aged 7, Helen aged 3 and Margaret aged 8 months. The years following Margaret Bowie's death could not have been easy for Bowie coping, as he was, with business and money problems plus the care of seven children. Undoubtedly his many Stirling relations, the Gillies', the Forresters and the Hills would have helped him bear the burden. Thus the family soldiered on for the next two and a half years until the tragically early death of the oldest son William aged 20 on the 18th November 1828 only one year after qualifying as a surgeon with the degree of Licentiate of the Royal College of Surgeons, Edinburgh. We know from the letter from Mrs Hannay to William on the 16th May 1828 that Alexander Bowie himself was not well at that time and we can conjecture that this plus the weight of the passing years and the strain of coping on his own with the family crises were all beginning to tell. In March 1829 he arranged for his will to be drawn up and on the 1st July 1829 he too died leaving, Robert, Mathew, Christian, Alexander, Helen and Margaret. (*Bowie's Will) He was buried on July the fourth in his own lair at the Holyrude Church in Stirling. Although, over the years, the Bowie's seem to have lived comfortably enough neither the jobbing building business nor the housebuilding seems to have generated any surplus capital. He was continually mortgaging recently built property to finance his next venture. In 1820, for example, he pledged Nos. 7 and 9 Allan Park as security for a loan of �600 and in 1826 Nos. 2 and 4 for �500 and �600 respectively. N.B. This may not have been need but good business practice----we may change with the new evidence that Helen inherited �10.000 as mentioned in the 'Annals' written by her son James A. Search of the sasines definitely needed. SASINE SEARCH DOES NOT SUPPORT �10.000 REPORT. "At Stirling on the fourteenth day of January Eighteen hundred and thirty one years In presence up supra compeared George McGowan Writer in Stirling and produced &c and whereof the tenors following viz. Inventory of the personal Estate of Alexander Bowie Builder in Stirling who died on the 1st day of July 1829 sho his movable estate to be in the region of �1200. The trustees administered the estate on behalf of Bowie's children. It must have drawn most of its income from the rental derived from Nos. 2, 4 and 6 Allan Park the stoneyard and rent of lairs in Holy Rood. The need to use this property for income can be deduced by the fact that the children had to move out of No.2 Allan Park in 1830. It is possible that the family was split up. Later information suggests that Margaret's sister Agnes Hill was involved in their upbringing. We can therefore assume that this large extended family immediately looked after the welfare of the children. The stoneyard and business were advertised for sale as a going concern. An advertisement in the Stirling Journal & Advertiser for 21st January 1830, however, indicates that the stoneyard was available to let for a period to be agreed and that the equipment consisted of a stable, a barn and granary with a pump and well plus other accommodation. In addition there was a quantity of both dressed and undressed stone available. The notice also indicated that Bowie had "enjoyed a considerable share of the business" suggests that some others were also involved. ADD THOMAS TRAQUAIR HERE Any potential leasee was also offered the reputation and goodwill. The unsold builder's yard presumably remained let providing some income to the Bowie estate. The terms of Bowie's will were such that the estate was to be held until the youngest, Margaret, reached the age of 16 years in effect until 1841. At that time the estate was to be realised as cash and equally divided among the children or their heirs. Margaret's will of 1846 shows that earlier a sum of �200 had been deposited in her account. Presumable this came from the settling of the estate. We can deduce a considerable part of the history of the Bowie children from the two 'Service to Heirs' recorded on 4th September 1846. These documents, in Latin, record that, by that date, Helen is the last surviving child of the Bowie/Hill marriage. Both documents start by listing those present and, in the first document, they swear that:- "The former Margaret Bowie residing in Stirling, sister of Helen Bowie residing in Stirling daughters and only surviving children of the deceased Alexander Bowie, builder in Stirling, died in the faith and peace of the Queen and that the said Helen Bowie bearer of these presents is the nearest and legitimate heiress of line of the said former Margaret Bowie her sister". The second - Service to Heirs reads:- "(They) declare that the former Christian or Christina Bowie, or McDonald who was spouse of Charles McDonald merchant in Glasgow sister of Helen Bowie residing in Stirling, only surviving daughter and children of the deceased Alexander Bowie builder in Stirling. N.B. We could do with checking on the date of marriage and death of Christina. Annals say she died in childbed 1845 hence the settling of affairs in 1846.. These documents represent the preliminary stages in the final settlement of the Bowie estate. Helen's brother Robert was presumably dead by 1846 although details may not be easy to find as he reputedly ran away to Jamaica as a youth. He was considered by Helen to be 'wild'. (Philp Annals). Alexander, a clerk in a bank, died in 1840 aged 20 and, from the Service to Heirs documents discussed above, both Christian and Margaret were dead by 1846. Helen and Margaret had lived in a flat at 82 York Place, Stirling, up until Margaret's death. This flat, may well have been subsidised by the trustees to provide a home for the family. The 1851 census records that Agnes Hill, Margaret Bowie's sister age 61, head of the household and her neice Helen Bowie age 27 together with a servant Janet Bennett age 30 lived there. After all the affairs were settled they moved to Pitt Terrace, Stirling, from which address she was married to David Philp on the 3rd July 1856. Comments about the early deaths of the Bowie's ten children together with the health of the populace in general, epidemics at this time, together with comments about hygeine and public sanitation. On to the story of William Bowie. Surgeon at 19 died at age 20.